« Weeks 9,10,11 of Marathon Training. Staying on Track with Race Preparation when Traveling. Lasagna is the ultimate Italian comfort food for a lot of us. 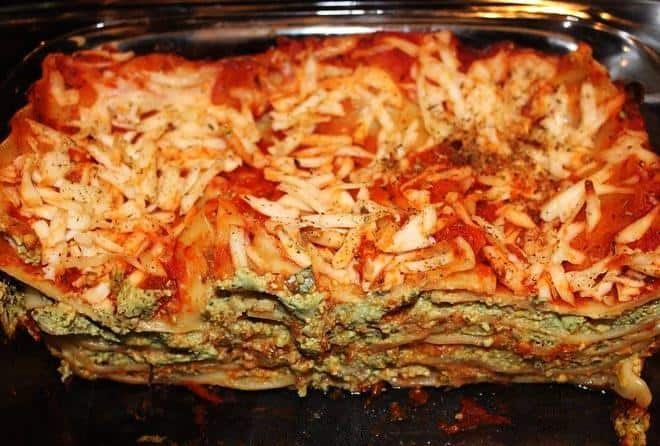 Multiple versions of vegan lasagna recipes can be found online, and if you’ve switched to a plant-based vegan diet a while ago, you’ve probably tried at least one or two of them. 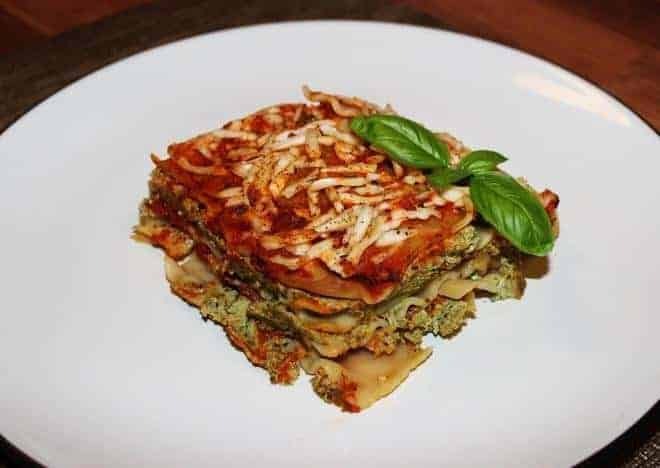 Vegan lasagna recipes can vary in their level of difficulty, so today I’ve decided to share a fairly simple lasagna recipe that I came up with not long ago. Like most of my recipes, this version of lasagna has a lot of vegetables and no added oil. I was born in Uzbekistan (a country that used to be a part of the Soviet Union) and grew up in Russia, and for a very long time we had little to no idea about Italian cuisine. Obviously, Italian people were not that eager to move to the Soviet Union and teach us the tricks of Italian cooking! Growing up, I heard the magic word ‘lasagna’ in American movies and TV shows, where it was always referred to as a delicacy. Of course, I was curious to find out what lasagna really was, so once I found myself in America at the age of 20, I headed to an Italian restaurant and ordered a piece. Just like the movies promised, it was delicious! Of course, that lasagna was nowhere near vegetarian or vegan. In the years that followed, I became more and more interested in nutrition and healthy eating. After a lot of reading up on the subject, I came to a conclusion that eating vegan was the healthiest thing I could do to myself from nutritional standpoint, so I never looked back at that meat-and-cheese laden piece of lasagna! Instead, I set out on a quest to create the healthiest lasagna recipe that would include lots of vegetables and none of the grease. To make sure my lasagna came out melt-in-your-mouth creamy, I used a block of tofu instead of ricotta cheese for the filling. It’s great if you have homemade marinara sauce, but if you’re pressed for time, it’s fine to use store-bought marinara: make sure it’s not overly high on sodium and has no added oil. Some people like using the no-boil lasagna noodles, but I prefer the regular kind that I first boil for about 5 minutes. Feel free to use the no-boil noodles if you like, but make sure that they are not overly processed. Speaking of healthy options… The question might arise: should we be using fake cheese here? Store-bought fake vegan cheese is often heavily processed… My answer: you’re free to omit the cheese on top if you want to steer clear of all the ‘fakeness’. I rarely use vegan cheese anyway, but if I decide to go for it, I make sure to read the ingredients list first. Some of the fake cheeses out there even contain casein – that totally defeats the purpose, doesn’t it? Oh, and if you have an awesome recipe for homemade cheese (both mozzarella- and cheddar-style), please send it to me! This is a basic recipe for a classic vegan lasagna. Using whole-grain noodles and adding lots of vegetables to the filling makes it much healthier than its traditional Italian version! Bring a large pot of water to a boil. Add 1 Tbsp salt. Add lasagna noodles, let the water get back to boiling, reduce the heat to med-high, and cook noodles according to the package directions until they are a little firmer than al dente. Make sure not to overcook! Once done, take each noodle out of the pot with kitchen tongs and set aside to cool. (I usually hang them around the sides of a colander.) Meanwhile, make the filling. Heat 1-2 Tbsp water or vegetable broth in a nonstick pan over medium heat. Add onions and garlic, cook until onions are translucent, adding more liquid to prevent sticking to the pan. Stir in bell peppers and mushrooms, cook until they start getting soft. Add kale leaves, cover the pan with a lid, and let the leaves wilt for about 3-5 min. Take the pan off the heat and let cool slightly, for about 10 min, and then transfer the vegetables into a bowl of a food processor. Crumble a drained and pressed block of tofu on top of the vegetables in the food processor. Add nutritional yeast and all spices. Pulse the mixture in the food processor a few times until well mixed and smooth. Taste and adjust salt and pepper to your liking. Spread 2 Tbsp of prepared marinara sauce on the bottom of an 8" by 8" ovenproof pan (I use a Pyrex glass pan). Arrange a layer of precooked noodles over the sauce, cutting the noodles to fit the pan. (You can use the cut off pieces of noodles in the following layers.) Spread 1/4 to 1/5 of the tofu-kale filling over the noodles. Add 2 Tbsp or more marinara sauce on top. Cover with a layer of noodles (see notes). Continue assembling the following layers in the same manner (noodles-filling-sauce) until you have 4-5 layers. The top layer needs to be only noodles and marinara. Sprinkle with shredded vegan cheese. Cover the pan with aluminum foil. Insert lasagna into the oven, bake 20 min, then remove the foil and bake for another 20 min. Remove from the oven and let cool for at least 10 min before cutting and serving. 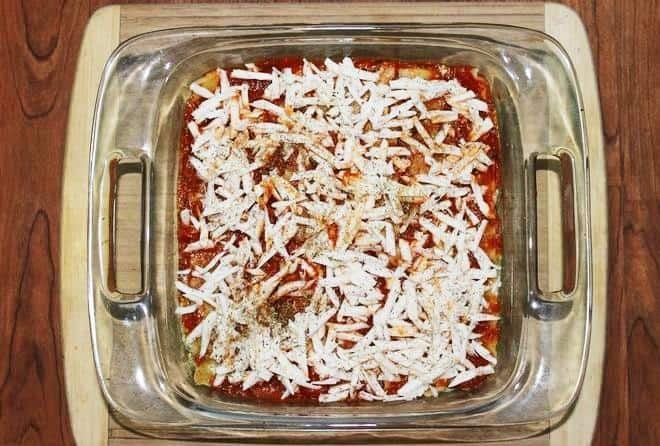 To make your lasagna sturdier, arrange your noodle layers at 90 degrees: the first layer should go from your right to left, the second - from top to bottom, the third - right to left, etc. Veggie-Loaded Vegan Enchiladas Recipe – a Plant-Based Dinner to Warm Your Soul! Tagged Italian, kale, tofu, traditional cuisines, vegan dinner, whole food plant based diet. Bookmark the permalink. version. Thank you for sharing!